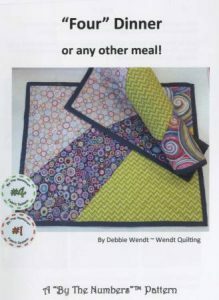 These cuts are supported by a line of patterns designed by Debbie Wendt of Wendt Quilting that show exactly which fabric cuts you need for each pattern. 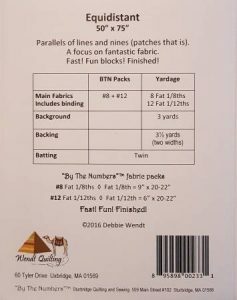 The back of the patterns show both yardage and By the Numbers requirements so they can be sold even if you choose not to kit “By the Numbers”. 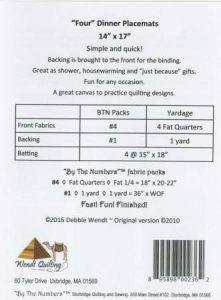 Here are the current options – showing the front AND back of the patterns so you can see how it works: Done by Three has a #4 on the front so you automatically know that it uses fat quarters. The back cover shows that you need three packs. Therefore this throw can be made with twelve fat quarters – a total of three yards! 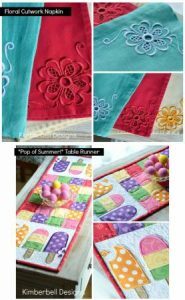 What an economical and easy quilt! 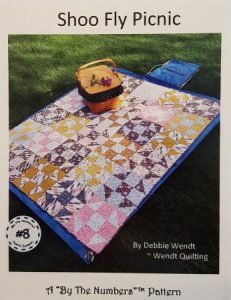 And the patterns are just $5.00! 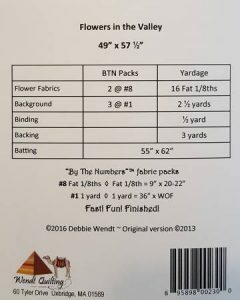 Flowers in the Valley uses three 1 yard cuts and sixteen fat eighths. 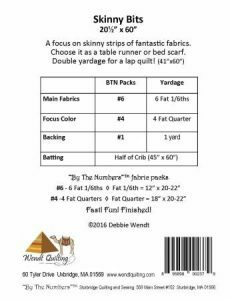 Bow Tie Blues requires eighteen fat sixths, two half yard cuts, and a one yard cut for the border – or a total of five yards of fabric! 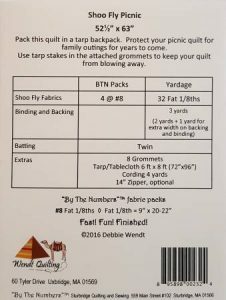 Shoo Fly Picnic uses thirty-two fat eighths, two yards of background, and one yard for outer border and binding. Equidistant uses eight fat eighths and twelve fat twelfths. Starting to make sense??? What a great way to kit and use ends of bolts or organize your fat quarter display into usable bundles. 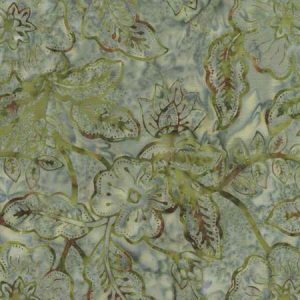 This is an obvious choice for those customers who are hesitant to pick out their own fabrics. But not all of the patterns are quilt sized. If your shop vends, this would be a great way to package fabrics to reduce cutting – and hauling bolts of fabric to the show! Going to Spring Market? Gina is giving a schoolhouse explaining the entire By the Numbers Fabric System. Hear from the expert exactly how to start a program in your shop! We have had many requests for an 18 1/2 inch version of our most popular workhorse – the 8 1/2 x 24 1/2 inch ruler. You asked, we listened – and it is IN STOCK now! 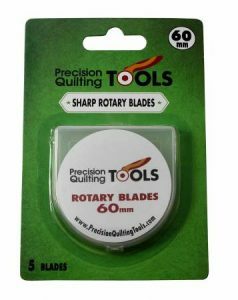 It is the perfect size to span the most popular size of rotary cutting mats. And, since it is 25% smaller than the original 24-1/2″ version, it is easier to manipulate. 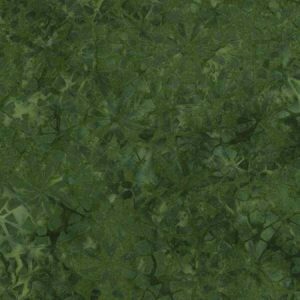 The wide width makes it the perfect choice to square up corners and borders. 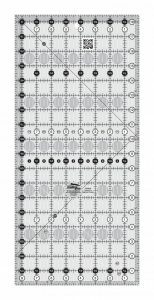 It features easy-to-read black and white markings printed in 1″ grids marked in 1/8″ and 1/4″ increments. 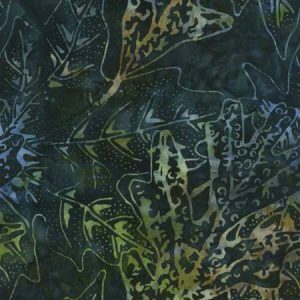 Use the black numbers (printed on white dots) and the 1/4″ grip sides to cut whole inches, while the white numbers (printed on black dots) and the 1/2″ grip sides add the 1/2″ seam allowance. 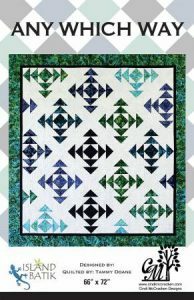 Use the white 45º angle to trim half-square triangles in whole inch increments. Use the black 45º angle to trim half-square triangles in half inch increments. An additional black 45º line is placed so that two angles cross 1/4″ away from the outside edge. 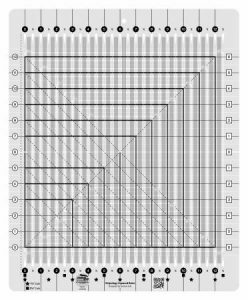 Use these markings to square up flying geese units; squares set on point or mark cross-hatching. The ruler also features a 30º- 60º angle. White horizontal and vertical lines are printed on the rectangle so the center of the ruler is easily distinguishable. 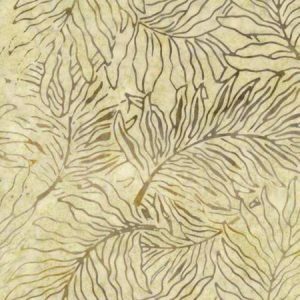 Use these lines to fussy cut stripes and borders. I didn’t want to leave anything out so the above is the description exactly how it appears on the website. This is a perfect opportunity to introduce this ruler and reiterate the great features of the entire line! 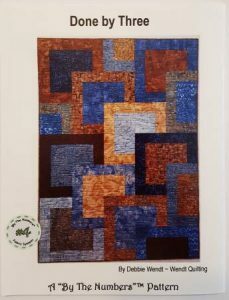 Looking for a Large Quilt? 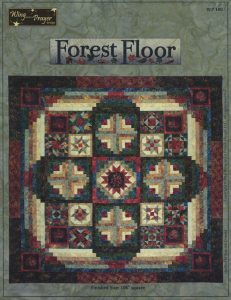 I love quilts that actually fit a bed and this 106 inch square pattern called Forest Floor is the perfect size for a queen or king size bed. 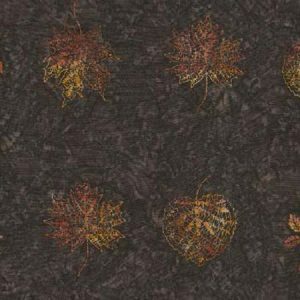 Forest Floor by Wing and a Prayer Design is simply stunning! 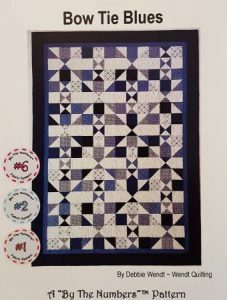 This block of the month quilt has such an unusual setting that you don’t even realize it was designed for a series of classes. 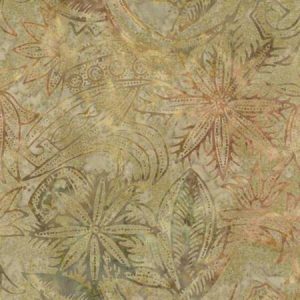 Made from a Timeless Treasures batik line, it is truly affordable since it only has eleven different fabrics! 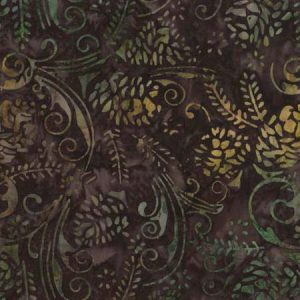 And just look at the fabrics…..once again, simply stunning! 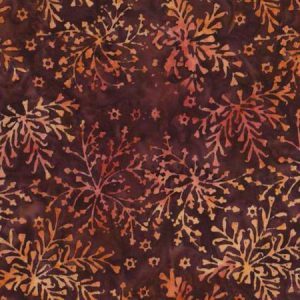 This is striking in Batiks but would be amazing in other fabrics as well. Why not make it in more than one colorway? Created specifically for machine dealers and quilt shop owners, our original program will bring customers into your business and have them returning each month for more. For a one-time price per shop location, Kimberbell grants permission to the dealer for the electronic file transfer to customer USB only. The designs may be included with class registration, kit sale, or an embroidery club membership fee, but may not be sold individually. Instructions for each project may also be copied for the customer. 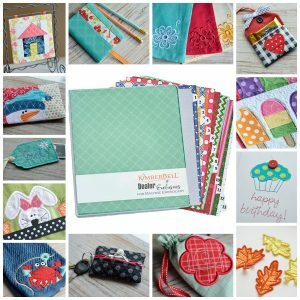 Kimberbell Designs does not limit the number of customers you are allowed to make copies for, which means your in-store club or class can be as big as you like! 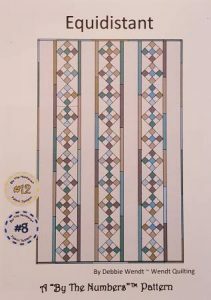 Volume 1 features twelve exceptional projects designs for a 5×7 hoop or smaller. 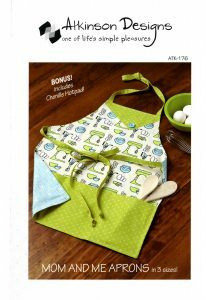 Each one is perfect for an embroidery club or monthly class, product demo, or make-and take. 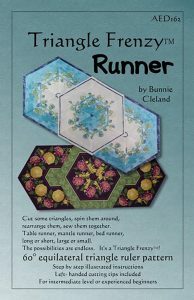 You’ll be delighted with the additional sizes and options included with several of the designs, plus the bonus table runner that incorporates both sewing and embroidery! 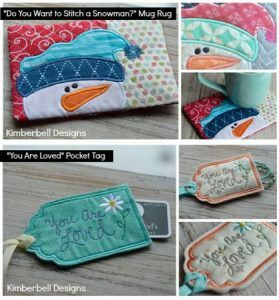 Kimberbell Dealer Exclusives provides the content to start an embroidery club at your shop and solves the dilemma of what to teach month to month. The projects can be presented in the order you desire. This means the club could begin any time of the year or, you can choose a favorite project for a special shop event. Tools for teaching and Kimberbell’s quality instructions are all part of the package so your customers will feel success trying new products and techniques. The only thing I can add? Pictures that show the projects! How cute are these??? And, I love the diversity! Don’t you love it when the nicest people are so talented too??? Need a quick gift – or several gifts? 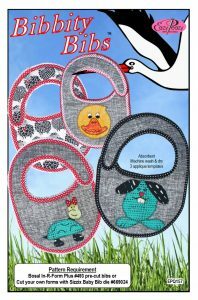 Check out these bibs and purses by Easy Peasy. 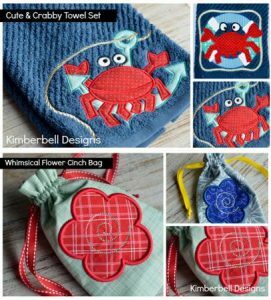 All of these can be made in an afternoon so they are great choices for classes – and would be great ways to demonstrate sewing machines! To make it even easier? Use the pre-cut bibs by Bosal and the darling trims with crocheted edging by Vintage Door. 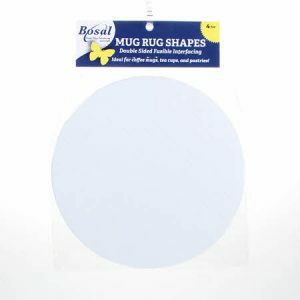 These purses use the pre-cut mug rugs by Bosal. Wouldn’t these be darling Easter gifts for those little darlings in your life??? Both would be great classes – and a great way to showcase these trims! The holiday season is all about food – and the gifts can be as well! These gifts can add that awe factor as well. Invited to Thanksgiving dinner? 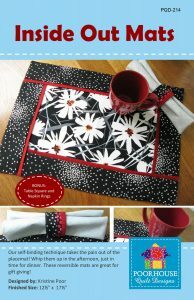 Why not give the hostess a table runner for a hostess gift? 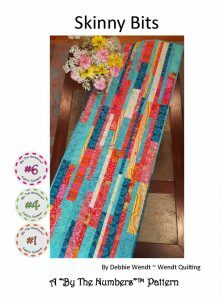 This Triangle Frenzy Runner is a great way to showcase a beautiful stripe and can be completed in an afternoon! It only has 14 pieces so you can definitely make more than one! Giving a kitchen related gift? Why not include a set of place mats? Here are two great options! 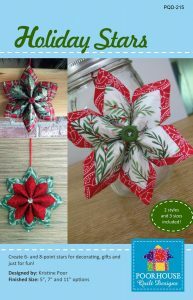 Take Four uses four fat quarters so it is easy to kit and fast to make! 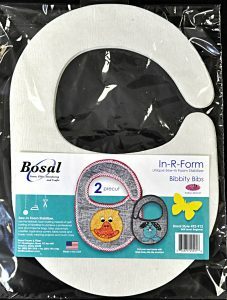 Inside Out Mats feature a no binding technique that means a set of four can be completed in an afternoon! Baking cookies a family tradition? Why not make matching aprons for everyone? I love this version which comes in Mother/Daughter sizes and is lined. Why not make the lining a light fabric? Then everyone can sign each other’s aprons as a lasting memory! Do you give gifts of candy? 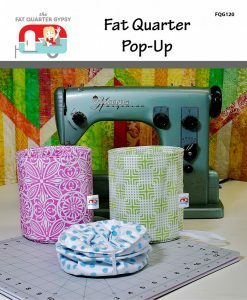 Why not present it in a Fat Quarter Pop-Up? The gift that keeps on giving! I know that the holidays are now a warm memory, but lets take a moment to reflect and do what we can to minimize stress for 2017. Sounds crazy – but hear me out! Make a list, or review the list, of everyone you gave gifts to this year. Then modify – who did you wish you would have thanked with a little something? 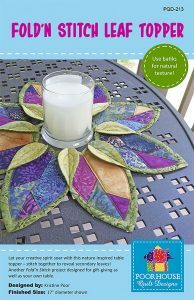 Over half of the top 100 patterns are not quilts! 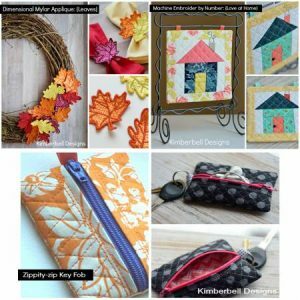 They are smaller projects that can be made in an afternoon, are easy to mass produce, and would make great little gifts or add that awe factor to others. Why not start a series of classes to help your customers prepare for the season? Gift cards and tickets to events are always a favorite. 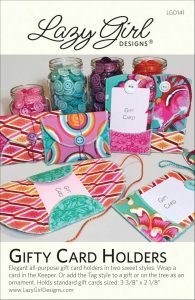 Why not make a collection of Gifty Card Holders? 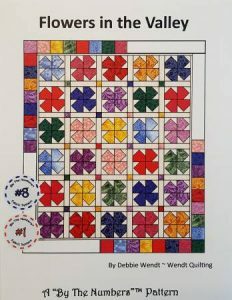 You can make a dozen in an afternoon out of 10″ squares. An added bonus? You know the recipient will reuse them as well – Go Green! Sell sergers? Show that edging as a quick and easy alternative. This Open Wide! 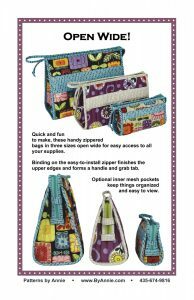 bag designed by Annie Unrein is easy to make and comes in three sizes. A set of all three would be a great gift or split them up and fill them with a little something. The zipper has never been simpler – it is bound on each side and then attached so anyone can do it – and is a great demo. These ornaments also come in three sizes and are the perfect package tag for those special gifts. Instructions include a six petal or eight petal version. Date and sign the back for a lasting memory. These would be great favors for a party. Picture your table with a star i the center of each plate…..
Everyone loves candles. Why not add that awe factor by including a holder with the gift? 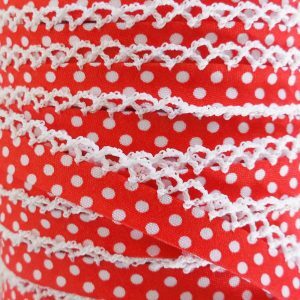 This is also a great opportunity to play with those decorative stitches on your machine…. 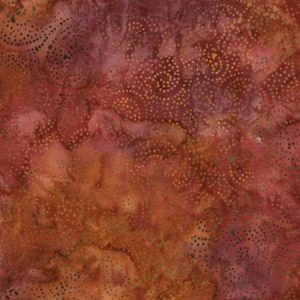 Have some quilting friends? 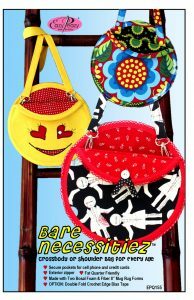 Wouldn’t they love this arm chair pin cushion and organizer? 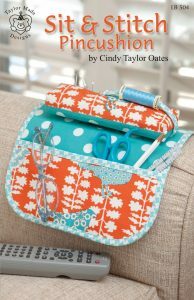 Fill it with sewing essentials – the perfect gift for those who are just getting started or need a travel kit. Many of these are great gifts to make with friends and family as well. Why not plan family craft days so the kids can help make gifts for their teachers? Many of you know Laura Heine because you have fallen in love with her collage quilts. Now she has combined forces with Peggy Larsen to create My Kinda Town. 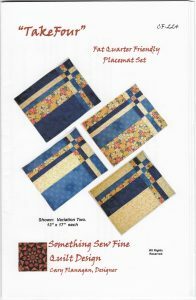 This paper-pieced pattern includes full sized patterns. 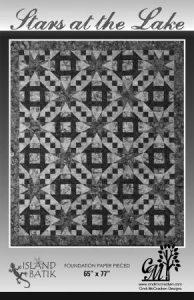 This 42 x 54 inch quilt is a perfect size for a wall hanging or baby quilt! It is actually a combination of nine different blocks so it goes together rather quickly. I know I am still in holiday mode – but my first reaction? The Grinch would love this town! I wrote about these blades a few months ago when we first started carrying them. 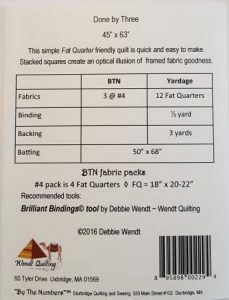 I ordered them and shared with over a dozen of my quilting friends. Drum roll please! They could not tell the difference between this brand – and the brand that they were currently using! They ALL wanted to order them! And at this price? 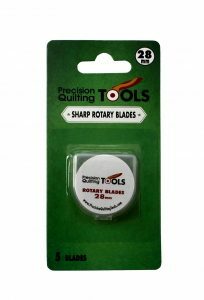 You will change your blade when it needs changing so rotary cutting just became a lot easier. 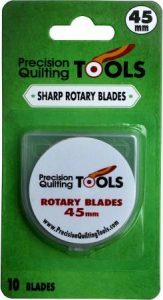 The blades come in four types or sizes: the most popular 45 degree; 60 degree; 28 degree; and a 45 degree skip blade. 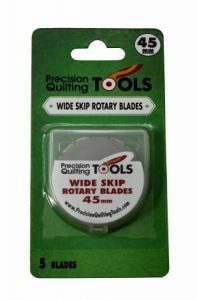 The skip blade cuts holes 1/4″ apart so it is the perfect choice for those who would like to crochet an edging on Cuddle Spa, fleece and flannel. The RETAIL price is less than half of the wholesale price of many brands so why not do your own test??? You and your customers will be glad you did. 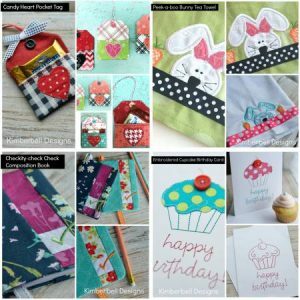 I love everything by Cindi McCracken! She takes traditional blocks and adds a modern twist that combines crisp, clean lines and fabulous color choices. 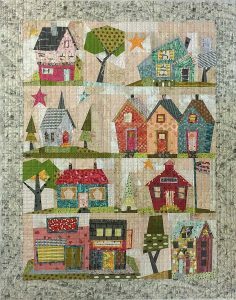 Stars at the Lake combines the charm of a traditional churn dash block with a simple paper-pieced block – the perfect opportunity to expose your customers to paper-piecing without intimidating them! 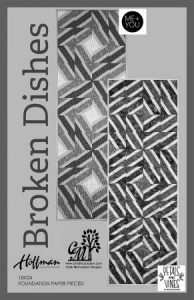 Broken Dishes is paper-pieced from strips so it is very impressive without any of the frustration. 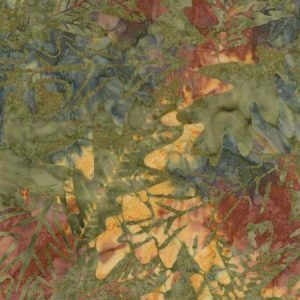 Any Which Way is striking in batiks and Fading Light can be made in a week-end. 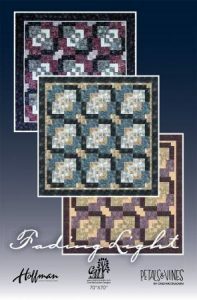 Both would be great additions to your “masculine” quilt pattern collection. 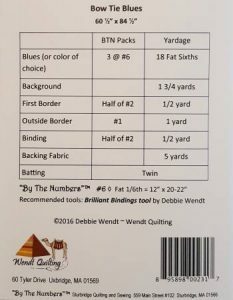 Cindi uses the new Stripology Squared ruler to cut her strips and recommends it in some of her patterns. Why not host a class and “race” with a student who is known to be fast? You use the Stripology Squared and they can cut with a traditional ruler. Once they see what a time saver it is, the tool will sell itself! All of these patterns are due to arrive this month so order them now!